The same-day edit wedding video by Partners in Motion Photography of Angela and Christian Mallari went viral for their unusual wedding celebration. It was shown on the video how the two pushed through their wedding despite Christian’s lifetime condition. 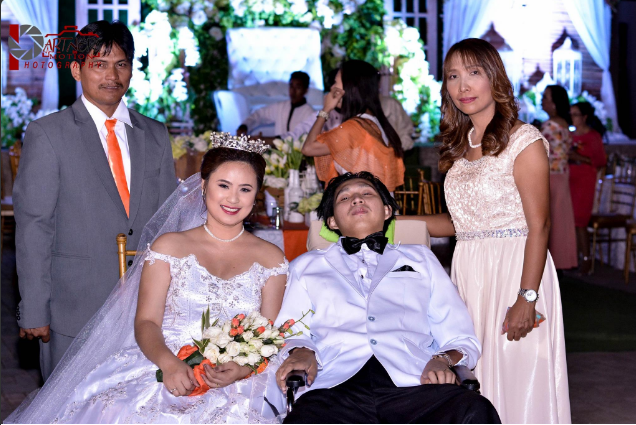 The wedding of Christian Mallari and Angela is not the typical joining of hearts celebration people often see but definitely one of the most heartfelt ones out there because Christian had to be seated on a wheelchair and be assisted by his friends and family in order to move around. 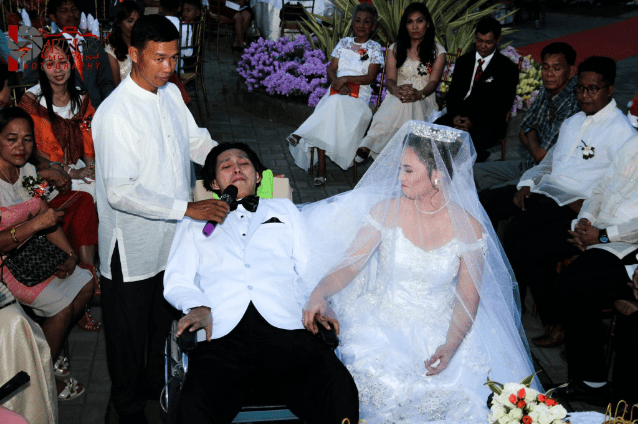 The wedding of Angela and Christian inspired thousands of netizens after this couple proved themselves how they loved each other in spite of Christian’s physical condition. The swear ” for better or for worse” has been tested in the case of Christian and Angela because the groom is paralyzed and can’t stand. 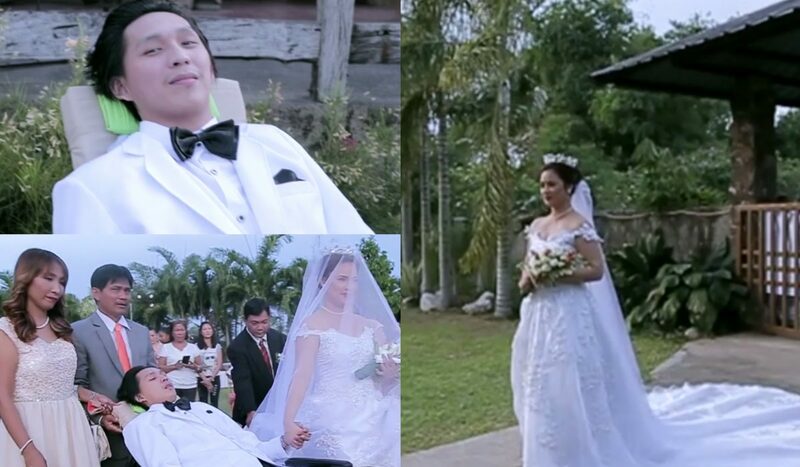 On their wedding day, the family of Christian help him to dress up and his entourage pushed his wheelchair. 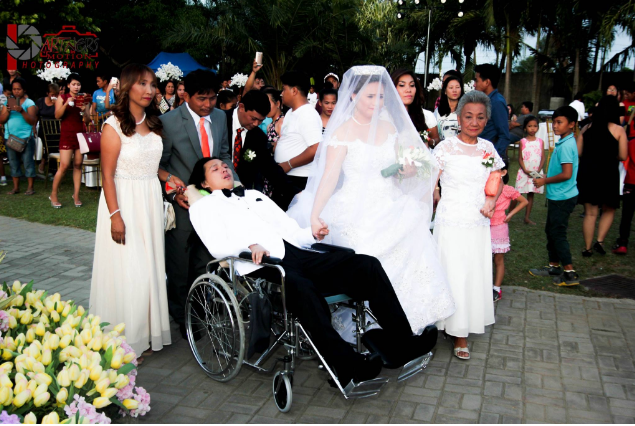 He wanted to run towards his bride but all he can do is to wait for his wheelchair to be push. “Ang tanging hiling ko sa Diyos ay yung bigyan ako ng isang taong mamahalin ako ng lubos. Hindi ako maghahanap, maghihintay ako. At sinabi ko sa sarili ko na kung dumating ang araw na ‘yun, hinding hindi ko na siya papakawalan,” (My only prayer to God is to give me someone who will love me fully. I will not search, I will wait. And I said to myself that if that time will come, I will never let her go.) Christian said on the video. “Angela, hindi mo ‘ko iniwan. Kahit anong mangyari sa ‘kin, nandyan ka pa rin sa tabi ko,” (Angela, you didn’t leave. Whatever happened to me, you are still here by my side) he added. Christian then followed up with a joke relating his health condition. “Kung iniwan mo ako, hindi kita mahahabol. Gusto ko man mag walkout kapag nagaaway tayo, hindi ko magawa, dahil hindi ako makatayo,” (If you left me, I can’t catch you. I might want to walkout if we have misunderstanding, but I can’t do it, because I can’t stand) he said with a light chuckle. Although he needs to be on a wheelchair on his wedding day, it’s easy to see how this charming man snagged someone as beautiful and caring as Angela. One day, Christian and Angela attended a fiesta celebration in one of their friends, and when they went back home riding a single motorcycle, Christian dropped Angela at her house and proceeded to his house but prior of his arrival, Christian meet an accident on the road that caused his spinal cord paralyzed for life and made him bedridden for the rest of his life. Their relationship started sometimes in 2015. A common friend becomes instrumental of their knowing to each other. They feel comfortable and get closed since then. When Angela got sick of anemia and confined in a hospital, Christian assisted Angela and take cared of her. Since then, they feel importance to each other and become lovers after a year. Unconditional love — in its most simplest form — means appreciating someone else for who they truly are. It means lovingthem when they are unlovable, and in spite of their imperfections and mistakes. At a deeper level, it means never, ever questioning whether you’ll feel any other way toward a person.